Nanjing gold medallist beaten in preliminary round, an upset or predicted? Places in the main draw of the Women’s Singles event at the Seamaster 2017 ITTF World Tour Platinum, Hybiome Austrian Open in Linz at stake; Chen Ke, Gu Ruochen and Wang Yidi all emerged successful in the preliminary round of the qualification tournament on the evening of Wednesday 20th September. However, for their colleague, Liu Gaoyang, the player who won the Women’s Singles title at the Nanjing 2014 Youth Olympic Games, there was defeat but was it a surprise? She was beaten in four straight games by Japan’s Marina Matsuzawa (11-9, 11-8, 11-7, 11-6); the win was as predicted, Marina Matsuzawa stands currently at no.71 on the Women’s World Rankings, owing to an absence from the international stage, Liu Gaoyang has no such listing. 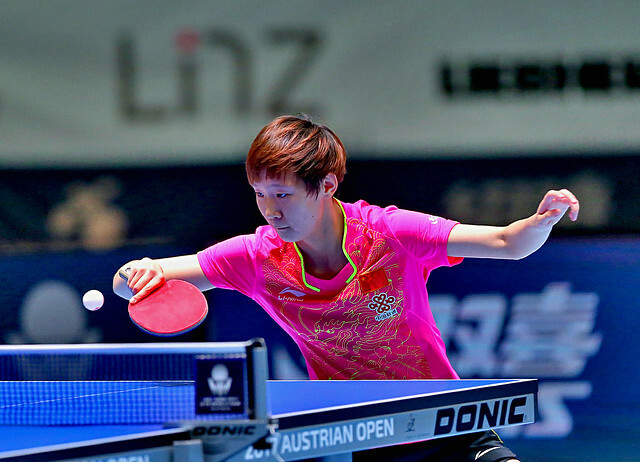 However, somewhat conversely; on their one and only prior meeting in a world ranking event, the decision had gone in favour of Lui Gaoyang; in the first round of the Under 21 Women’s Singles event at the GAC Group 2013 ITTF World Tour Japan Open, Liu Gaoyang had won in straight games. Success as ranking suggested; it was the same in the remaining four preliminary round Women’s Singles duels. Chen Ke and Gu Ruochen both stifled the hopes of Chinese Taipei. Chen Ke beat Liu Hsing-Yin (11-7, 10-12, 11-7, 11-4, 11-3), Gu Ruochen accounted for Lin Chia-Chih (11-8, 11-7, 11-8, 16-14). Likewise, Wang Yidi, who beat Hong Kong’s Zhu Chengzhu at the Nikon 2015 Hong Kong Junior and Cadet Open in both the Junior Girls’ Singles and Junior Girls’ Team events, repeated her success of two years ago. Impressively, she prevailed in five games (7-11, 11-2, 11-6, 11-6, 11-5). Three wins for China, it was two for Japan; in the one remaining preliminary round contest, Miyu Nagasaki beat the Czech Republic’s Hanas Matelova (14-12, 8-11, 11-9, 11-7, 9-11, 11-8). Play in the main event commences on Thursday 21st September.